Group Captain Kishore Kumar Khera, VM is a serving fighter pilot of the Indian Air Force. Click here for detailed profile. Africa aspires. In 1963, 33 independent African states gathered in Addis Ababa, Ethiopia to form the Organization of African Union, now the African Union (AU). On the occasion its Golden Jubilee in May 2013, Africa’s political leadership re-dedicated itself to the Pan African vision of an integrated, prosperous and peaceful Africa. The continental aspirations are well documented in ‘Agenda 2063'.1 With a clearly laid out implementation plan for well-articulated goals to meet the aspirations, Africa is moving in the right direction2; albeit a little slowly. The main reasons are intertwined and interrelated - conflicts and slow economic growth. To top this, the governments are splurging on building their military capabilities. Agreed that military capabilities are essential to ensure security and thus economic activities. But these need to be developed in accordance with the envisaged threat scenario. The capability development programmes need to meet essential targets first prior to looking at desirable characteristics. Secondly, the expansion of military capabilities needs to be in harmony with the national strategy and within the means available. Expenditure on non-essential military capability development not only impacts on other governmental schemes internally but also sets off a chain reaction in the region leading to an arms race. Gradually and systematically, the regional military expenditure increases and developmental goal relegated. Therefore, it is essential that the AU monitors developments in this respect and keeps ‘Agenda 2063’ within reach. 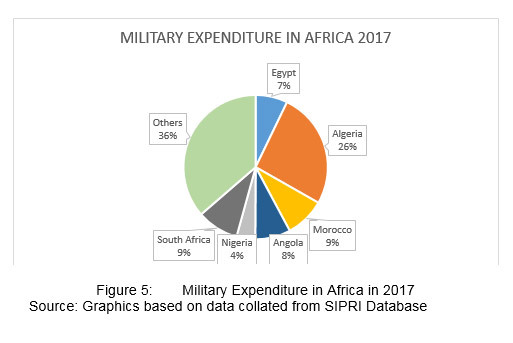 Stockholm International Peace Research Institute (SIPRI) database on military-related expenditure up to the year 2017 indicates that Africa, on an average, is spending more than the world average on its military (Figure 1).3 Governments in Africa spend 100 percentile points more than the world average on their armed forces. In fact, that has been the trend for the last 30 years. After the end of the cold war, the world over, government expenditure has been declining steadily. The same is not true for Africa. After peaking over 12.5 per cent of government expenditure in 1999, it has come down but continues to stay higher than the world average. A cause of concern. In absolute terms, the military expenditure in Africa is much lower than the world average. However, in the last 30 years, Africa share of world military expenditure has increased from 1.9 per cent to 2.3 per cent. Today, per capita military expenditure in Africa is around one-sixth of the world average (Figure 2). 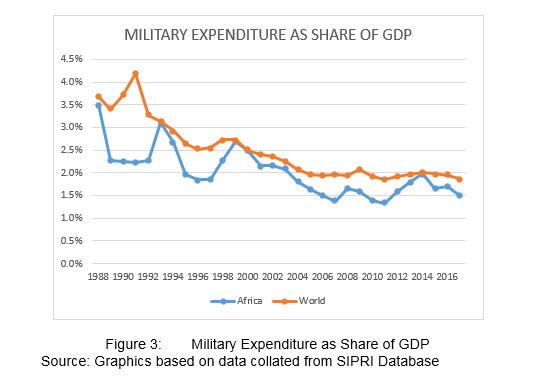 Trend analysis of the last 30 years indicates that per capita military expenditure in the world has increased by 26.8 per cent and in Africa, it has grown three times faster. Low base and inflation can be cited as contributory factors, yet the growth rate is alarming. 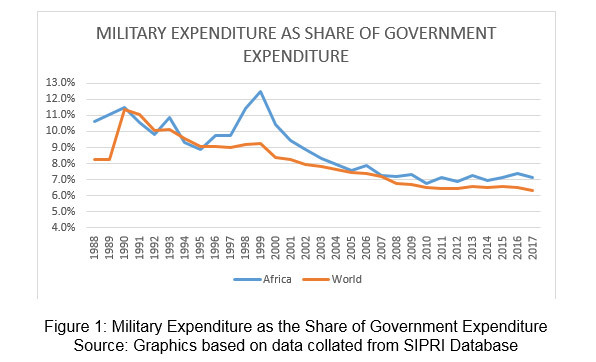 This accelerated growth in military expenditure in Africa obviously has socio-economic costs. The development growth has been stunted and goals of Agenda 2063 pushed a little further. 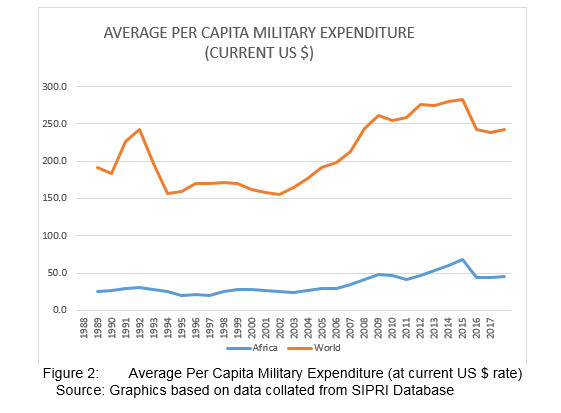 Military expenditure as a share of GDP is an important parameter and often utilised as a benchmark in assessing international military spending. On this account, Africa is spending a lower share of its GDP than the world average (Figure 3). In the last three decades, the share of GDP the world spent on the military has come down from over 3.7 per cent to 1.9 per cent in 2017. Africa’s military expenditure nearly matches the world trend reaching 1.5 per cent of its GDP in 2017. For developing and underdeveloped countries, this still is a huge financial burden and needs to be further corrected. 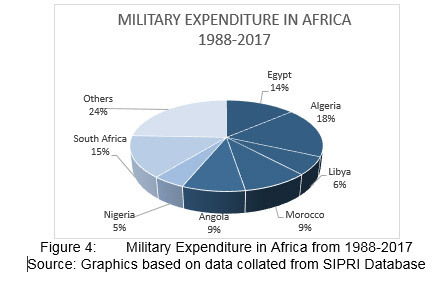 In the last 30 years, seven countries account for three fourth of the total military expenditure in Africa (Figure 4). The scenario has not changed much and Algeria continues to be at the pole position with a greater lead over other nations in military spending in Africa (Figure 5). The big spenders in this arena need to relook and reassess their threat perceptions and synchronise it with the military capabilities that need to be developed. While countries in North Arica need preparations to deter any expansion of conflict from war-torn West Asia, the same is not true for central and southern part of Africa. Induction of frontline combat aircraft like SU30 and Gripen in countries with no military threat to its borders is perplexing. The Africa Union (AU), since inception, has done a reasonable job of reducing number and intensity of interstate conflicts in the continent. Is there a sense of insecurity among states in Africa? Possibly, yes.4 That appears to be the main reason for the development of military capabilities in certain countries. A perception seems to prevail that developed military capability allows negotiations from a position of strength. This possibly has resulted in large spending on militaries. The AU needs to take initiative to build and evolve robust and transparent conflict-resolving mechanisms. That will allow states to cut back on their military expenditure. Secondly, democracy is still taking roots in Africa. Militaries, being loyal to the state, tend to be pampered by the ruling class who intend to retain control of the state.5 For internal dynamics and extension of control, states exercise little direct control over military expenditure. This mechanism suits the political class and the military but the state suffers. Lastly, in most parts of the world, military expenditure skips professional scrutiny and hides behind the garb of national security. A fertile ground for corruption. In fact, Agenda 2063 unambiguously lists corruption as a major risk.6 Procurement of high value desirable military hardware instead of low-value necessary equipment is a common folly. A number of high-value deals for military equipment in Africa may not meet the essentiality criteria. With communication improving, democracies will mature so will transparency. This will allow growth of apolitical militaries with enhanced professionalism. The result will be a rationalisation of military expenditure. Africa, despite plenty of natural resources, remains low in the Human Development Index.7 It needs to develop its infrastructure. However, with finite financial resources, investments need to be prioritised and the government expenditure on military needs to be rationalised. Operationally, the possibility of large interstate conflicts is low and diminishing further. Credit for this goes to the visionary leadership of the African Union. However, intrastate conflicts and non-state actors continue to threaten Africa. These have the potential to derail Agenda 2063. The threats, that Africa faces today, do not need strong and large conventional military forces. But what is required is - small and potent groups that can move quickly to thwart potential threats. To implement this strategy, the most critical tool is battlespace transparency. A synergetic pan Africa approach can ensure a high level of transparency with a large number of sensors monitoring the critical areas. This approach will help Africa skip the third and fourth generation of conventional capability reforms and move directly to what is relevant today. Broadly, the focus needs to be on trimming the conventional military capabilities and building smart forces that can handle the security challenges of tomorrow. Infusion of technology in intelligence and decision making loop along with the development of rapid deployment capabilities will hold the key. It will lead to significant resource conservation and achievement of “Silencing the Guns by 2020’.8 An audit of required military capabilities and therefore, military expenditure in Africa is essential. Efforts need to focus on scaling down of conventional military capabilities. An appropriate step taken in this direction at this juncture will assist Africa in achieving its visionary goal of Agenda 2063. Group Captain Kishore Kumar Khera, VM, is Research Fellow, Military Affairs Centre, IDSA. 1. The African Union Commission, Agenda 2063, Frame Work Document, September 2015, at www.un.org/en/africa/osaa/pdf/au/agenda2063.pdf (accessed on July 17, 2018). , September 2015, at www.un.org/en/africa/osaa/pdf/au/agenda2063-first10yearimplementation.pdf (accessed on July 17, 2018). 3. SIPRI Databases, at https://www.sipri.org/databases/milex (accessed on July 17, 2018). 4. See n. 1, p. 102. 6. Ibid, p. 64, p. 102.Modest progress is being made in fighting corruption, however according to Transparency International, four out of five African countries are below the world average and there is corruption in the military. 7. UNDP, Human Development Report, 2015, at https://ipfs.io/ipfs/QmXoypizjW3WknFiJnKLwHCnL72vedxjQkDDP1mXWo6uco/wiki/Human_Development_Report.html (accessed on July 17, 2018).